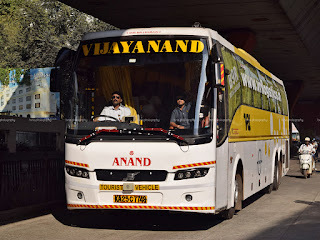 I had too little options as I looked for buses to travel from Mumbai to Bengaluru - I wanted a seater bus, and wanted to avoid sleeper buses - since I was not comfortable in sleepers, for some reason. The only available seater options were either too early, or too late. 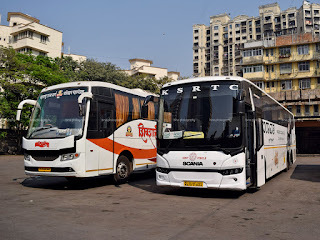 After a lot of searching around, I decided to pick-up KSRTC - and booked on the first services, which originates from Mumbai Central. I was to spend the day in south Mumbai, and Mumbai central made sense. Every journey is memorable! Every journey has a story! This journey is one I would keep close to my heart! I have been wanting to go to Mumbai since sometime now - the desire got stronger as my life took a turn recently. I badly wanted to meet my fiancée who works in Mumbai and I had to travel at a very short notice - the decision to travel was taken hardly 24 hours before the actual journey commenced. Flights were too expensive - the two way bus journey cost me less than half the one way flight fare. It had to be the bus, undoubtedly. This was a very short trip - departing Bengaluru on a Saturday evening, and I had to be back on Monday morning. I wanted a seater bus, not a sleeper - since I've felt quite uncomfortable in sleeper buses earlier. I finally picked VRL for my outbound and KSRTC for the return.